Brightly colored Easter Eggs, adorable Easter Bunnies and cute Easter Chicks all spice up your table decor when they become salt and pepper shakers. Easter salt and pepper shakers are beautiful ways to brighten up your table for Spring. You'll have a hard time deciding whether to added brightly decorated Easter Egg salt and pepper shakers; cute-as-can-be Easter Bunnies that look like they're ready to hop from one end of your table to the other; or Easter Chick salt and pepper shakers that will peep right into your hearts. Be sure to check out the video below get some tips on how to decorate for Easter on a budget. Combine these smart ebay projects with some crafting and you'll be already for a fantastic Spring celebration. The Easter Bunny is certainly a beloved Easter symbol. While known for eggs, it's really the candy that most of us love him for. Add a pair of Easter Bunny salt and pepper shakers to your table and it will bring an instant sense of whimsey to your table decor. You'll find traditional pastel colored Easter Bunnies as well as Chocolate Easter Bunnies. Sometimes the bunnies are just left to hop around your table. Other times they are penned up in a lovely Easter Basket display. While the Easter Bunny is certainly great with eggs, don't be surprised if you see him sporting a flower or two. Spring is the time that we associate with the beginning of the growing season. I know I always am looking for snowdrops, tulips, and daffodils on my early spring walks. Apparently the Easter Bunny is no different. You can decide if you want to pair up your Easter salt and pepper shakers with a crisp white tablecloth or opt for the pastel shades so popular with this holiday. After a cold and dark winter in Maine where I live, I do enjoy adding a bright yellow or soft green tablecloth to my kitchen. It's a wonderful transition to the sunflower decor that I love during the summer months. Don't have time to decorate Easter Eggs this year? Not to worry. 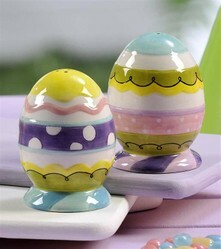 You can include these functional and brightly colored Easter Egg salt and pepper shakers on your Springtime table. I love it when decorations perform a useful function. I don't have time to change out figurines every season. But I certainly can change out my Christmas or winter salt and pepper shakers for some brighter and festive spring colors. I find that there are lots of polka dot Easter Egg salt and pepper sets available on ebay, in a great variety of colors. Some of my favorites have bright bows on top in complementary colors. Others have bands of bright horizontal colors. If you're a fan of metallic colors there's lots of gold-plated or brass Easter Egg salt and pepper shakers. If you want to be a rebel, try combining a black tablecloth with golden Easter decor. Perhaps add some bright red tulips. Crisp white lilies would be a fantastic contrast. If brides can wear black wedding gowns these days, then you can certainly celebrate Easter with black decor as well. I love shopping for small items like this on ebay. You'll find hundreds to choose from, which is more than you find in most Main Street shops. Many of the people who sell items on ebay are small business owners or individuals who are trying to pay their bills. It's a way to help the local United States economy and enjoy the convenience of online shopping. You can always check to see where these table accessories are shipped from if there is a specific locale that you'd like to support. I often haunt yard sales and thrift shops looking for things like this, but there aren't very many in my rural area. I only have so much time and gas that I want to spend on small holiday decorations. So when I realized what a selection there was on ebay, I became a very enthusiastic ebay buyer. It's actually very easy to get a sense of the seller, when you check out their Positive Feedback Rating. You can even see comments left by earlier customers. This really lets you know how someone treats buyers on ebay! You don't have to spend a fortune to have a great Easter display. The video to the right gives you some tips and ideas to transform every day objects into fabulous Easter decorations. You'll love the Easter bonnets and baskets that you can make and stay on budget. The soft textures and rich color will please any child. If they're old enough, let them join in the fun of making some of these items. Holiday salt and pepper shakers to easily create a festive flair on your Christmas table - Santa and Mrs. Claus, Reindeer, Snowmen, Christmas Trees and Gingerbread Men!